ESPA Team went to Glasgow! Home > Blog > ESPA Team > ESPA Team went to Glasgow! A company Christmas dinner during a company Christmas trip in the freezing but extremely beautiful Glasgow. Our team building started at 6 am by waiting at the airport with a two-hour delay because of an engine breakage of our airplane. This didn’t break our spirit and a few hours and cups of coffee later we reached our destination ready to explore! Cross dazzling bridges, express your artistic side in the Kelvingrove Art gallery where you can make your own art, shudder while exploring the famous Necropolis and walk your feet off going around the city and its cheerful Christmas market are some of the things we would suggest if you ever visit Glasgow during Christmas time. On our second day, we decided to visit Edinburgh by taking the train. A mesmerizing city with multiple beautiful buildings aging as back as the 12th century. By joining an informative tour about the city’s history, we learnt multiple interesting facts about it along with being accustomed to William Brodie (or Deacon Brodie as he was named later), a Scottish cabinet-maker, and Edinburgh city councillor, who maintained a secret life as a housebreaker and likewise other local myths and legends. 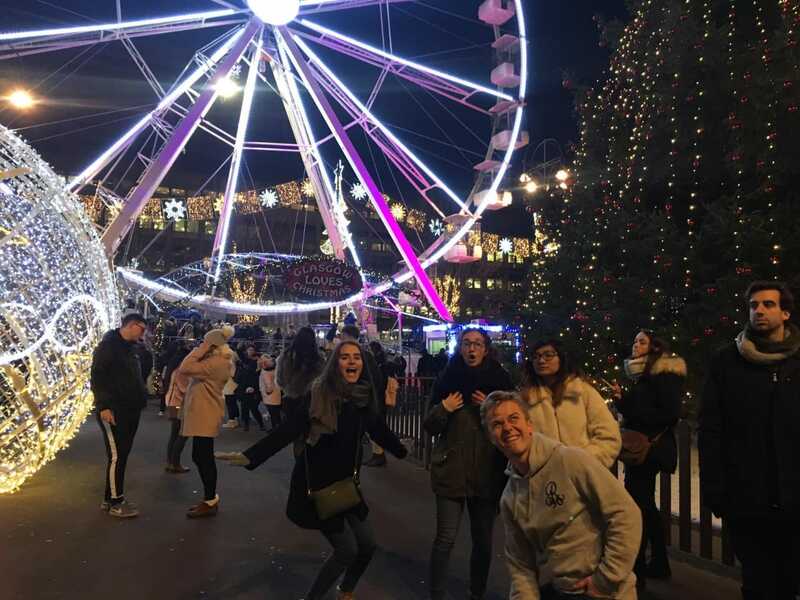 The day ended with our luxurious Christmas dinner back in Glasgow where we had delicious Spanish dishes and drinks and danced enthusiastically until the morning hours. Affected from the notorious night we had we silently went to the airport laughing with the new stories we created. Many fresh jokes to share with your colleagues through some busy working days in the office, getting to know more about the people we spent 8 hours a day with, actually bonding with them by sharing common experiences and even acquire new friends through them. 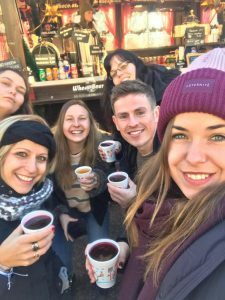 These are only some of the benefits we all got from our trip and we can all agree that it was an amazing Christmassy experience and that we are looking forward to our next team building activity, so we can spend some out-of-the-office time with each other! Luckily on Monday, everyone showed up at work with a very cheering mood!